This is a magazine I have published, with quotes by notable individuals and curators, and filled with double page spreads of images of my work, -- it's very impressive, beautifully printed on 80 lb. glossy paper. Forty-four pages, it may be previewed online (and ordered). It is, for me, a valuable sales tool. I make no profit on it; I have sold about 25 copies, a small number, but which I view as a success. This means that collectors are in possession of it, and thinking about my paintings. Other artists might consider doing something similar to promote their work. Publishing it is free! I think the concept is great, and if someone wants a profit, they just take that option, pricing the publication above print on demand cost-- they will receive payment via paypal. Andrew Wodzianski art month continues in DC with the opening of Wodzianski's Abra Cadaver in Bethesda's Fraser Gallery tonight, with an opening reception from 6-8PM. I am told that there may be a surprise in store for one of the District's better known art critics and that the surprise was almost revealed in the back pages of yesterday's Express newspaper. From what I can see of the exhibition here, it has some new clever pieces from Andrew's android series. Last night's opening at Flashpoint was packed, and although the artist was there all night, no one saw him, as he spent the entire opening inside a white casket being guarded by two very efficient, very pretty nurses. I noticed quite a few red dots, and people were also buzzing about the scavenger hunt associated with the opening, with several of the paintings in the show as the free prize for the hunt winners. Throughout the month, the artist will release a series of five clues via Twitter (twitter.com/househuntdc). Five people will ultimately have the chance to win a painting from the exhibition. There was also a good assortment of the usual suspects at the opening, and I had a chance to shake hands and kiss cheeks of people that I had not seen in a long time since I had moved away to Philly. Wodzianski will actually be present and meeting people in tonight's opening at the Fraser Gallery. The gallery is at 7700 Wisconsin Avenue in Bethesda, just a couple of blocks from the Metro. 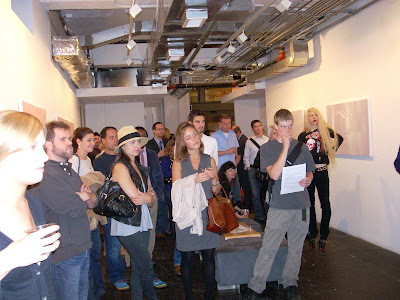 International Arts & Artists' Crit '09 has been scheduled for Wednesday, October 21st, 2009 from 6:30 - 8:30pm at Hillyer Art Space, located at 9 Hillyer Ct. NW, Washington, DC, 20008. This event is a scheduled open critique for all artists. Each critique will be open to 8-12 artists on a first come, first serve basis (but don't worry, this will be a monthly event). They are still accepting artists for this first opportunity until October 14, so don't miss out! If you are interested in participating, please contact Lachelle Slade at membership@artsandartists.org or 202-338-0680.